When the weather’s nice, there’s nothing better than gathering friends and family outdoors. 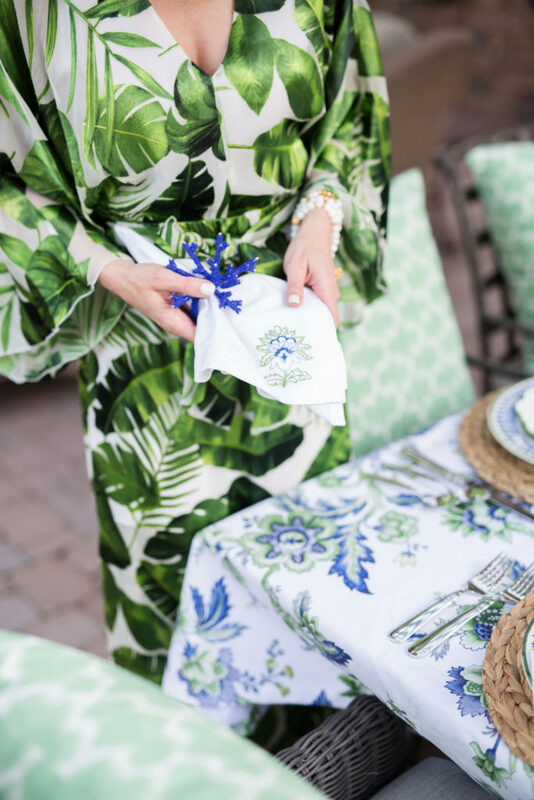 And when I first saw the new entertaining collection from Aerin Lauder’s collaboration with Williams-Sonoma, I knew I had to host a poolside dinner party as an excuse to buy some of the collection’s pieces. 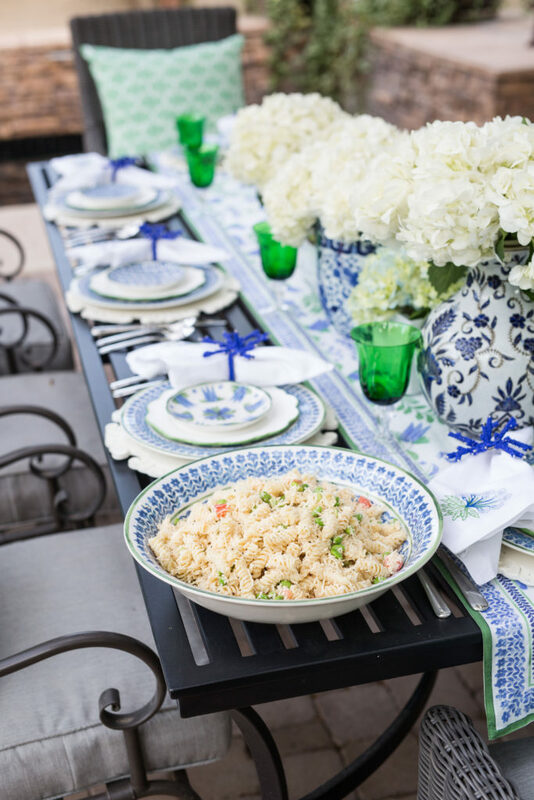 Check out some of my ideas for entertaining with this collection, along with some refreshing summer recipes you can use all season long. I set this table two different ways — one using the collection’s oiled tablecloth, and the other using the table runner. Layering the plates on top of the tablecloth added dimension to the place setting. 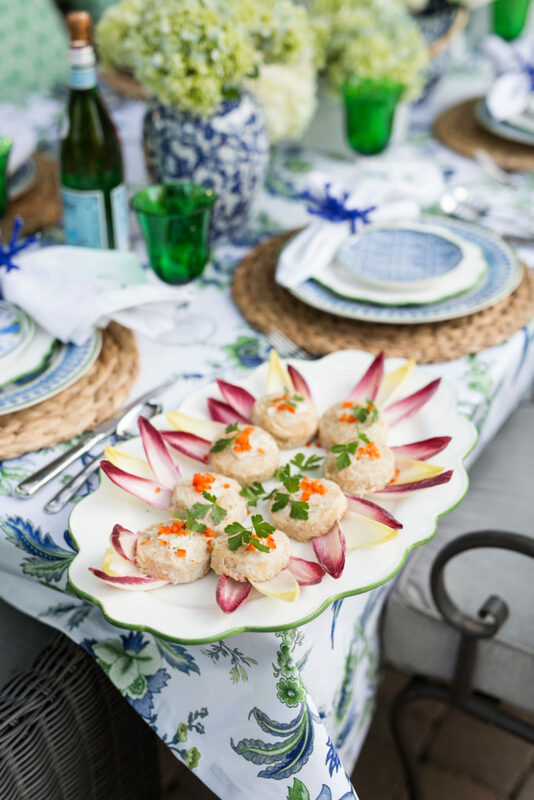 I used a seagrass charger, then the AERIN Ardsley dinner plates, the AERIN green scalloped salad plates and finally the mixed appetizer plates. 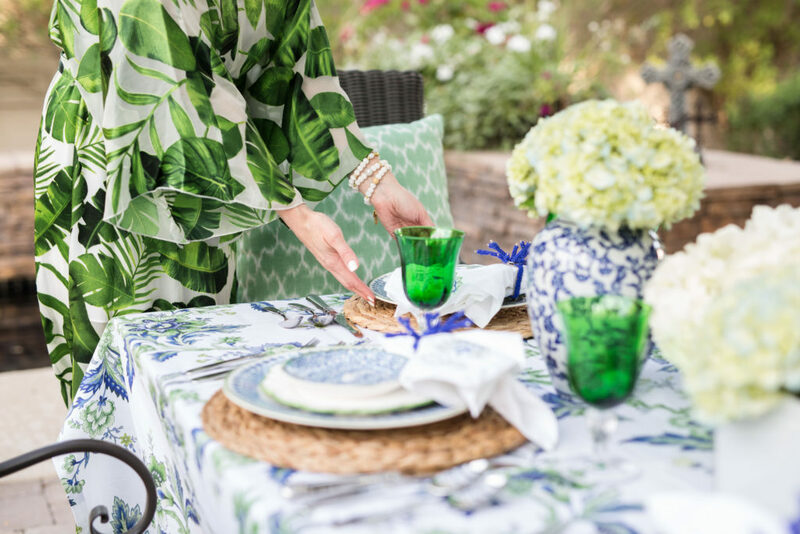 Together with the tablecloth, the seagrass charger created an inviting, organic feel. 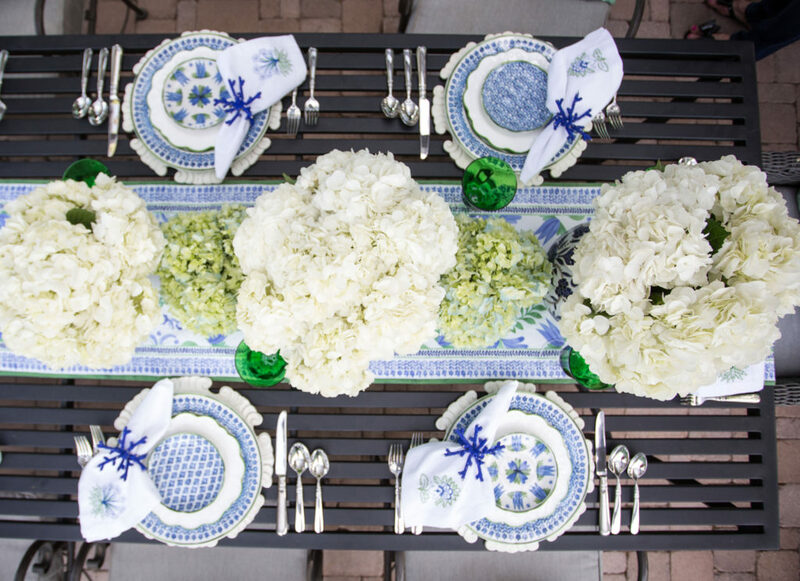 Pro Tip: When setting the table, layer to create height. This will add visual interest to your place setting! Modern glass goblets from the collection tied in nicely with the green hues from the linens. 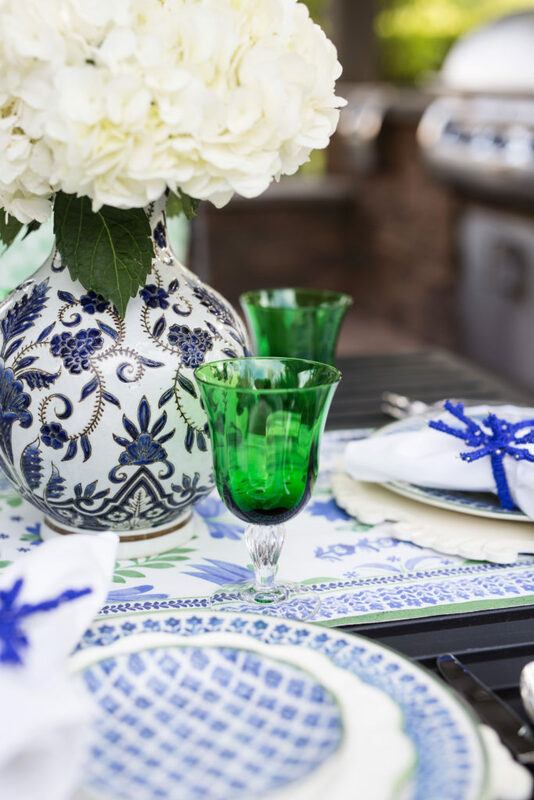 In a video on the Williams-Sonoma website, Aerin Lauder details her summers in the Hamptons with her grandmother Esteé, and shares how they enjoyed the outdoors together… I may not be a billionaire heiress to a cosmetics fortune, at least I feel like I can entertain like one! Here, I used the same layering of plates, but used a white wooden charger on top of my black metal table. This gave contrast to the plates and made the colors pop! 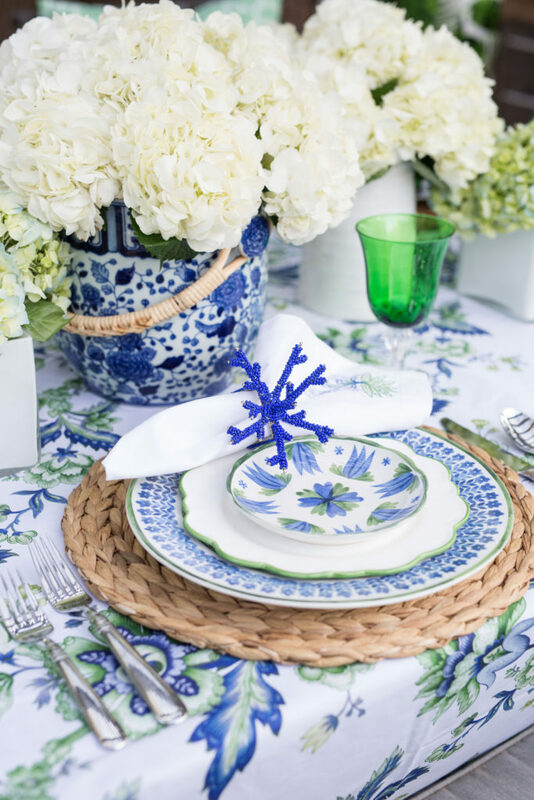 Embroidered floral napkins from the collection proved to be very versatile, and I have used them several times since with other place settings. Cobalt blue coral napkin rings from Kim Seybert were my own, and tied in seamlessly with my theme. Pretty sure I will use this bucket year round! Marketed as a Champagne bucket, I used this blue and white ginger jar as a fabulous vase for my flowers instead. It could also hold ice for drinks, wine, or even sparkling water bottles. My coffee table is it’s current home right now — it is just too pretty to put away! 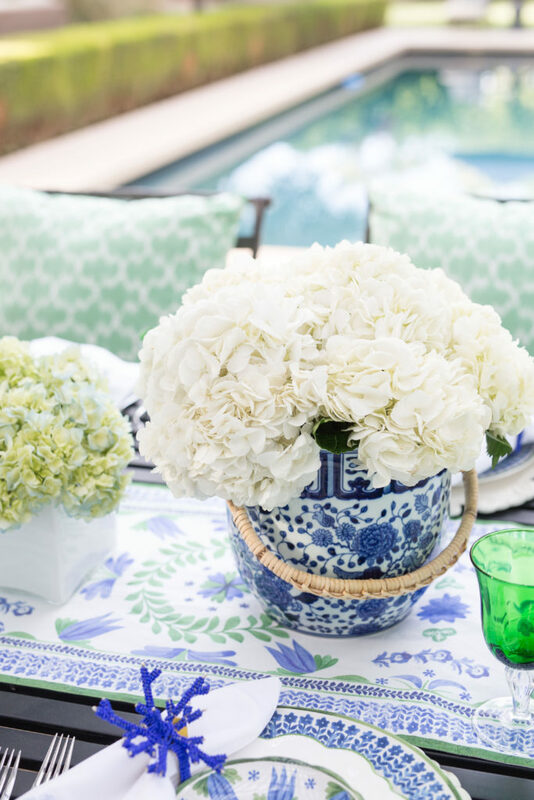 This gorgeous AERIN Fairfield oilcloth tablecloth is made from water-resistant coated cotton and won’t crack or peel. It’s meant to be used outdoors, and supposedly cleans up easily. This is a huge bonus in my Phoenix summer sun!! 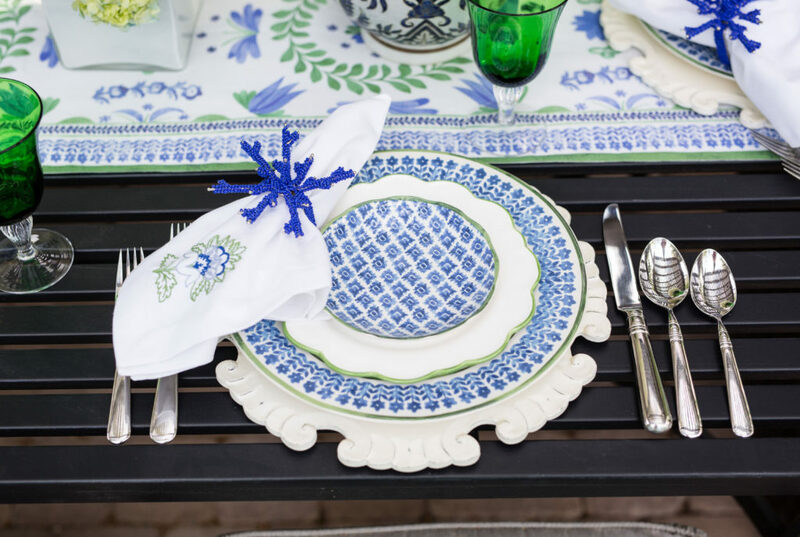 Featured here is the AERIN Ardsley table runner, and at a generous 108 inches it can accommodate a pretty long table (mine is 96 inches). 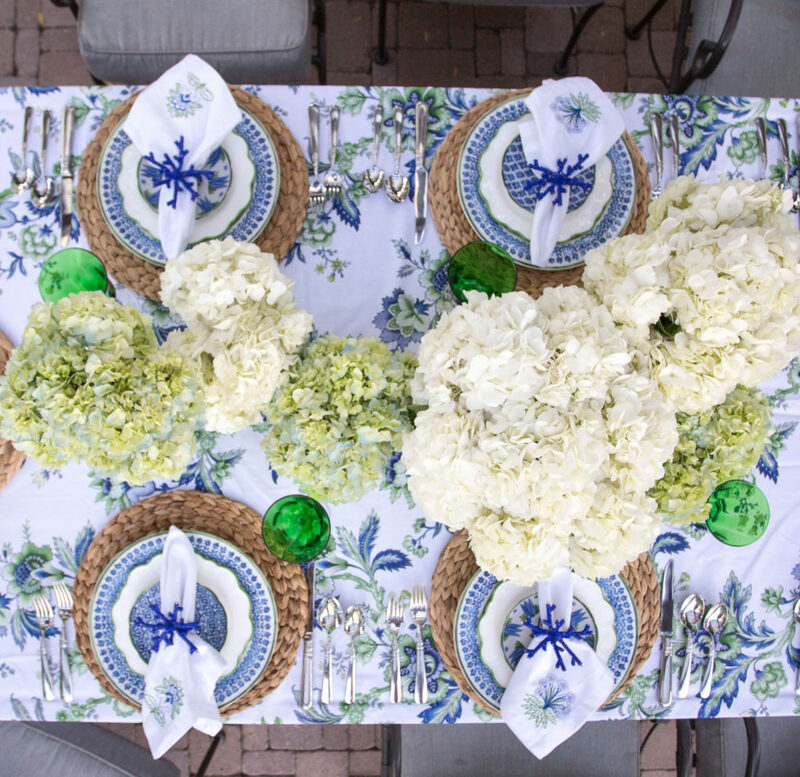 Hopefully you can see the difference that just one change of linen and set of plate chargers can make in the tablescape. I added in these lovely printed ikat green pillows with weather-resistant polyester (also from the collection). Blue pillows are also available, but I already have a nice set of blue and white striped ones. I loved how they softened up the setting and made our gathering even more inviting. There are a ton of versions of this salad out there, but I call this one the 8-Row Chopped Salad. 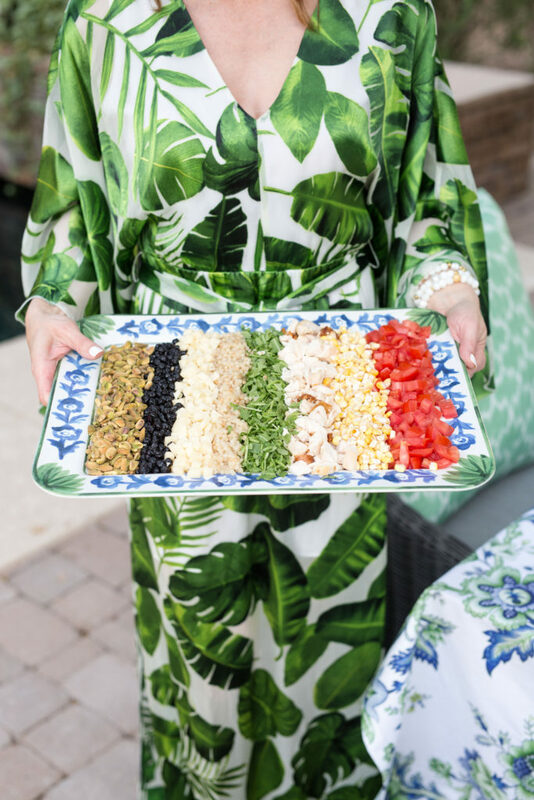 I love it for so many reasons: it’s relatively easy to put together, you can change up the ingredients according to your theme, its great for a crowd, and it looks fantastic on a platter. Pro Tip: When serving a nice visual dish like this one, make sure you let your guests catch a glimpse before you tossing it with dressing! This rotini Parmesan salad is simple one. I’ll admit I didn’t make this, but this crowd-pleaser’s few ingredients would make it very easy to prepare at home. Rotini pasta with edamame, tomatoes, and shredded Parmesan cheese —that’s it! How beautiful does this look? You won’t believe how easy it is! Are you ready to hear one of my all-time favorite party hacks? These crab cakes! They’re from Trader Joe’s — look for them in the frozen seafood section. Broil them at home until golden (under 15 mins), then add some fancy toppings. Check out the instructions for Crab Cakes with Dijon Aioli here. You didn’t think I’d forget my wine, did you? Bonus: the Pellegrino bottles match the goblets and the table decor! 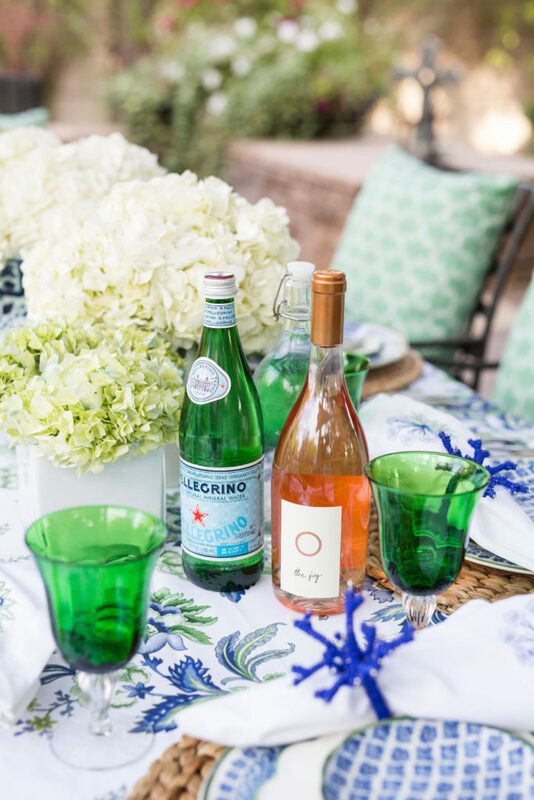 Pro Tip: Put out bottles of chilled sparkling and still water for your guests. This is a HUGE time saver. No more running around to fill glasses with ice at the last minute! 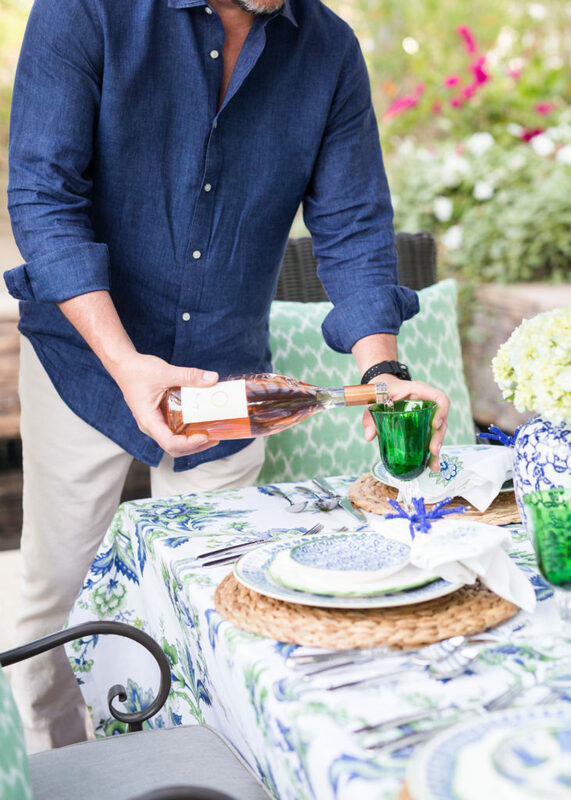 One of my most important tips for entertaining: give yourself a few minutes before guests arrive to enjoy a cocktail and relax so you can enjoy your party! This will also give you a moment to take in all your hard work!